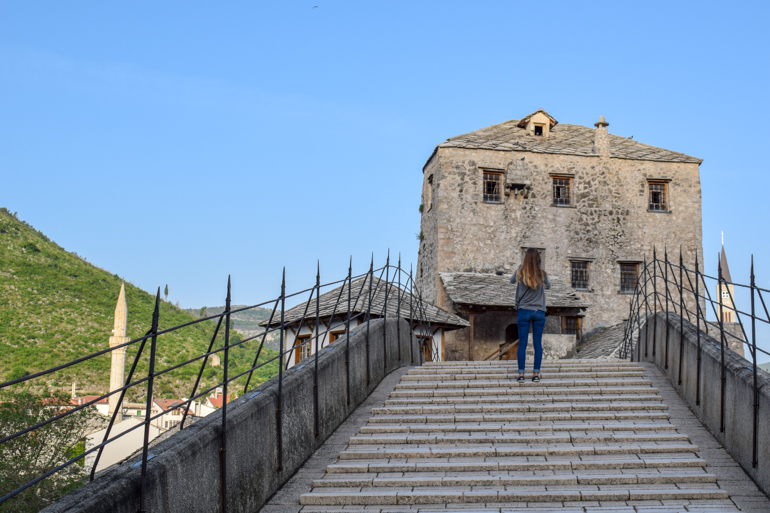 Here are Some Pretty Cool Things to Do in Mostar! 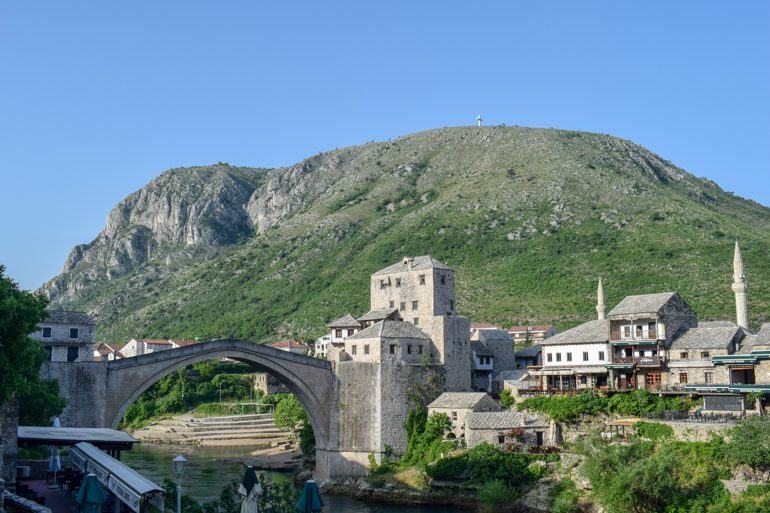 Let us guess – you’re looking for reasons why you should visit Mostar? Well, we’ve got a few of them for you in this post! 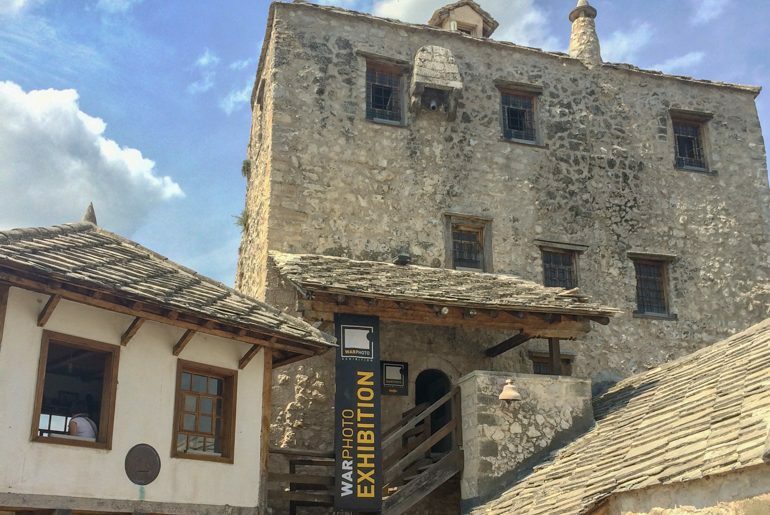 From the famous Mostar bridge called the Stari Most to the war photo exhibition – there are certainly enough things to keep you busy for one day in Mostar or if you’re there for longer. 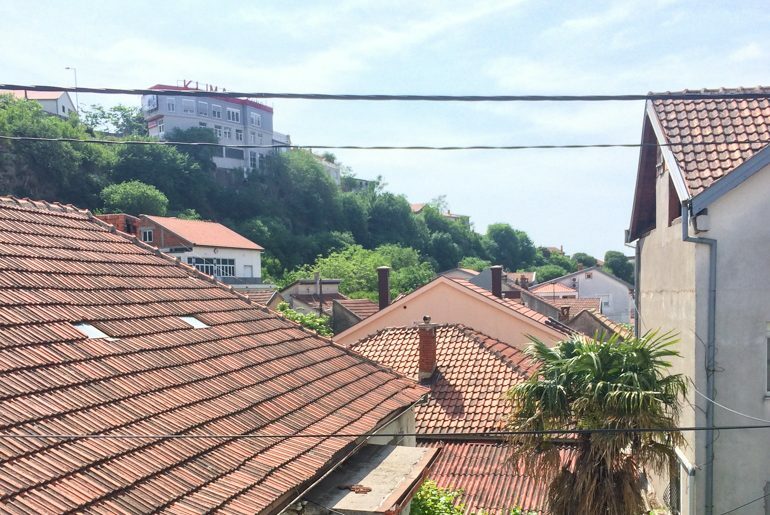 It’s no secret that we absolutely loved our time travelling around the Balkans. Bosnia and Herzegovina was a later addition to our itinerary. We are so happy we made the trip to explore parts of the country. 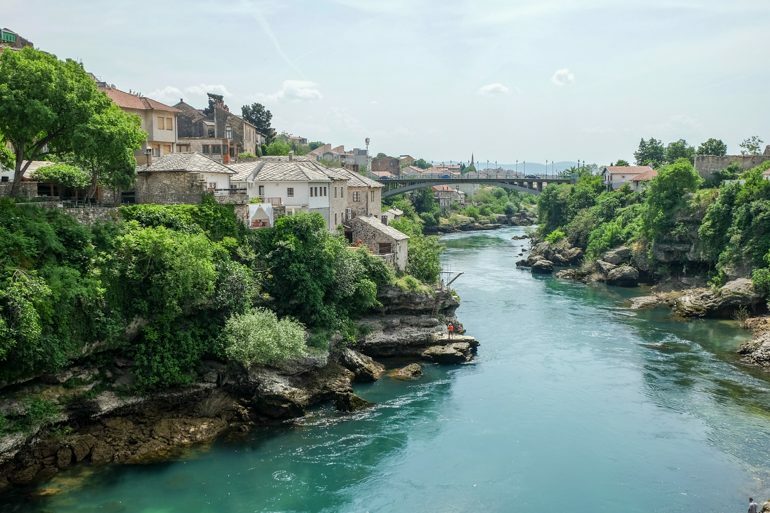 We loved it and we wrote a whole post about our experience in Bosnia and Herzegovina! So, if you’re planning on becoming a Mostar tourist and want to know what to buy in Mostar, we might even suggest you the items you’ll find in the shops. Spoiler alert: there’s lots of souvenirs to do with coffee! Ready to explore Mostar in Bosnia and Herzegovina? Here we go! If you want to see what we got up to in Mostar, watch the video snippet below. You can also watch the whole video on our YouTube Channel here. First time in Bosnia? 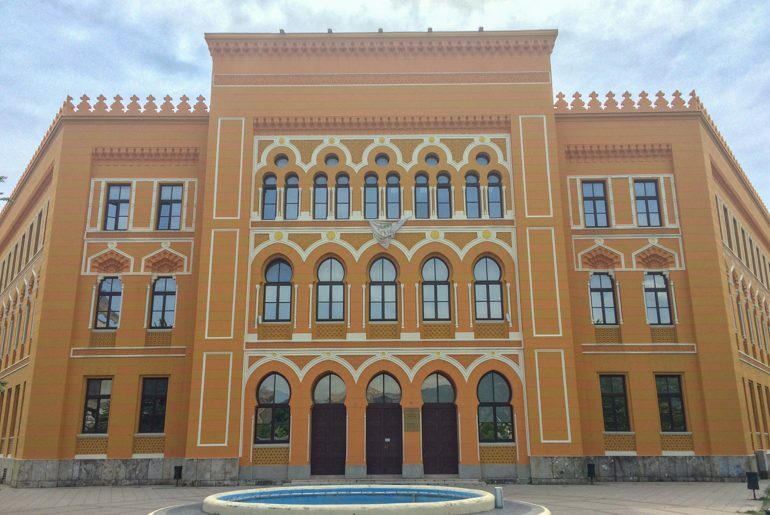 Check out the capital city and our post on things to do in Sarajevo! 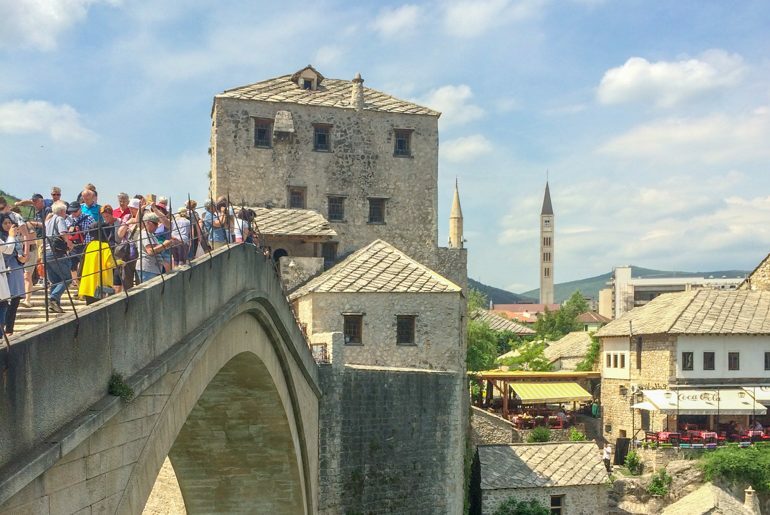 Heading to Dubrovnik after Mostar? Here’s our guide on the bus stations and the bus trip from Mostar to Dubrovnik! Eat Burek. Lots and Lots of Burek. Finding a place to stay in Mostar shouldn’t be too difficult given how popular the destination is. Day trippers choosing to stay overnight or travellers passing through on a Balkan route will have plenty accommodation options to choose from. You can search for deals in Mostar here to get started. The options include guesthouse-style places, actual hotels near the river, hostels with dorm-style rooms, and lots of private accommodations. Depending on how close you stay to the centre – which in this case is the Stari Most/Old Town area – prices will vary. We were able to find cheap accommodation at Eni Hostel. Technically, it’s a guesthouse. Located very close to the centre, it was walkable to all locations in Mostar. The bakery at the end of the street was an added bonus for our morning breakfasts. The view from our guesthouse room! Inside the gated house, there was a lovely little backyard. The house is run by a nice family who was very kind and easy to get a hold of for check-in. We had a private room and shared a bathroom with the other rooms on our third floor – but since it was the off-season, we didn’t have too many neighbours! So, if you want a guesthouse experience with a nice host family and a back courtyard, Eni is for you! They have amazing reviews – so check here for availability on Booking.com! 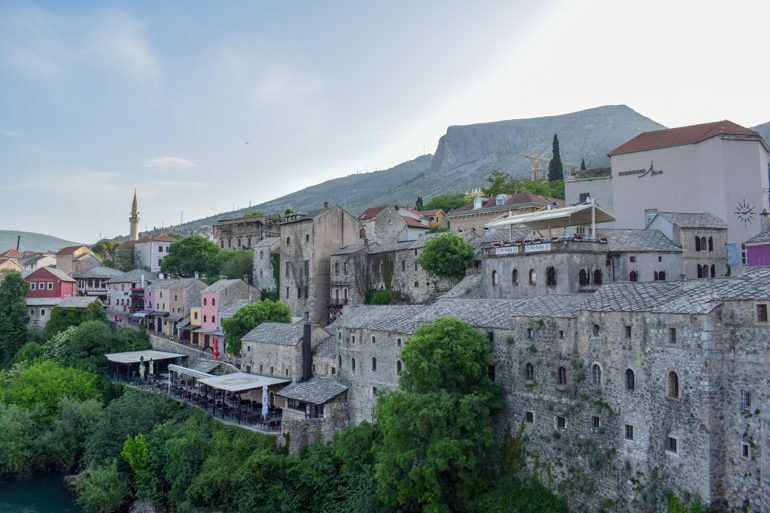 If you find yourself in Mostar, you’ll definitely be looking for things to do. While some things are obvious, others can be a little hidden if you don’t know where to look. It’s also probably important to mention that while the war ended many years ago, the two “sides” of the river are distinctly different. The west side is predominantly Bosnian Croat while the East side of the river is the Bosnian Muslim (Bosniak) side. 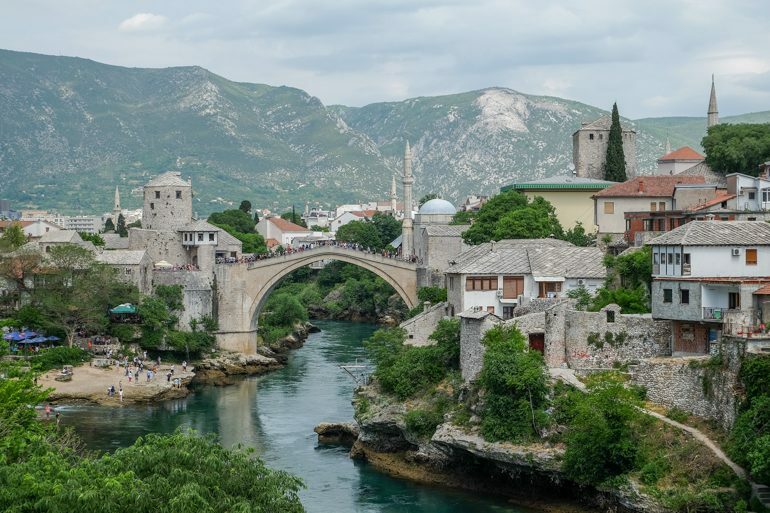 This is important to know for directions later in this post as well as understanding the ethnic and religious tensions of Mostar and in Bosnia, in general. Our guesthouse family spoke to us about how the city is still divided – with segregated schools on each side only allowing their respective ethnicity to attend. 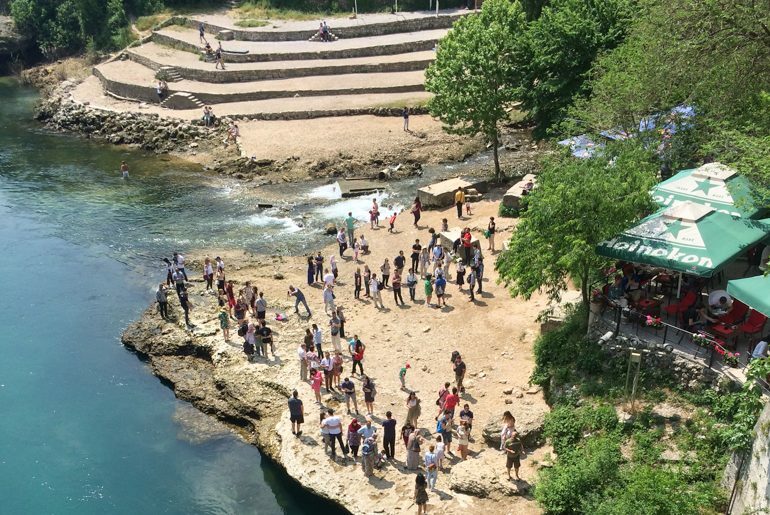 There is one immersion school in all of Bosnia and it’s in Mostar – so we will show you what that looks like down below! The city isn’t necessarily dangerous for either side, but tensions do remain built into the systems and the people. If you aren’t sure which side you are on, just look for the mosques on the horizon. They are beautiful and you’ll figure it out pretty quickly! 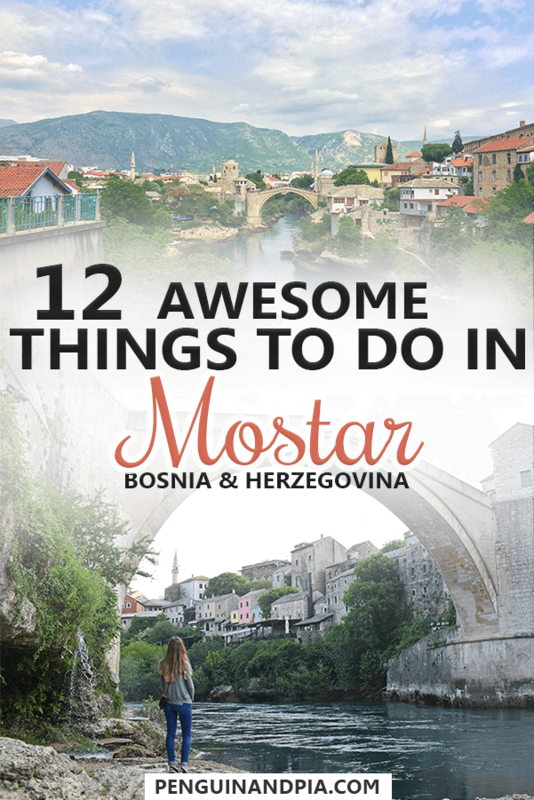 So, that being said, here are 12 things to do in Mostar! We started with the most obvious first because, well, frankly it’s the reason most people even know about Mostar in the first place. It’s also why Mostar is called “Mostar” in the first place! 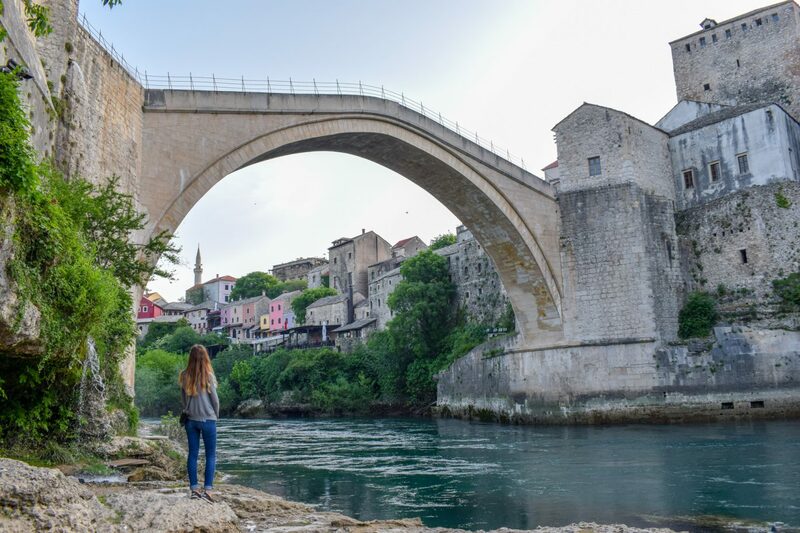 The Old Bridge or Stari Most, was an old arched bridge built in 16th century by the Ottoman ruler of the area. Known for its beautiful shape and architecture, the original bridge was a beautiful attraction with a functional purpose. The bridge took a decade to build back in the day. It actually replaced an old wooden bridge that made traders and locals scared for their lived when crossing it! Mostar is situated in a valley which makes the landscape beautiful. In the Bosnian war from 1992-1995, conflict engulfed the entire country. We talked about the conflict in Sarajevo in our Sarajevo post but the ethnically-fueled fighting was brutal in Mostar, as well. The difference here was that although Sarajevo was under siege by the Bosnian Serbs, the battles in Mostar was mainly between Bosnian Croats and Bosniaks (Muslim Bosnians). It was the Bosnian Croat army who destroyed the bridge on November 9th, 1993. You can find the old footage of the shelling of the bridge and the collapse on YouTube if you search hard enough. The mighty Neretva River flowing through the city – taken from the Stari Most. After the war, members of international community funded the estimated 15.5 million USD reconstruction of the bridge and declared it (and the old town Bazaar area) a UNESCO world heritage site. The bridge was rebuilt using as many materials from the local area as possible. Builders also (to the best of their ability) used the original construction methods from hundreds of years ago. The bridge can get VERY crowded – and this was in May! Today, the bridge serves as a reminder of the rich history of the area and of a violent past that isn’t actually that old. 30 years seems recent when you think about total in the context of many centuries. The bridge is a major attraction and so crossing it in the mid-day can be quite the challenge. Even in the beginning of May, the day trippers from Dubrovnik (and everywhere else close by) made it like a slow cattle walk across. It’s stunning – but really busy. Here is the Stari Most at 6:00 am. Beautiful. We, being the young and chipper souls that we are, got up at 6:00 AM to have the bridge to ourselves. We didn’t actually know if it would be empty – but we had a hunch that 6:00 am was early enough to only have to deal with a few early risers. Turns out, we were right! It was an absolutely incredible experience. Watching the sunrise around the valley and seeing the world slowly wake up with the river flowing below was a very humbling experience. We’re super glad we did that – so if you want the best pictures and a memorable experience, try getting up early! Worth the early wake up for the amazing experience. We then went down to the river’s edge to snap a few photos from below. Usually the rocky shore is covered with people but this morning there were none. You can see how busy it gets in a photo below. To our luck, there was a nice pair of ladies also taking early photos and we exchanged taking photos of one another. Lisa and I rarely get a photo together because we travel without a tripod – so we got a great shot at the Stari Most with no one on it. We’re really happy we did! PRO TIP: Wake up at 6 am to see the bridge empty. The Old Town Bazaar before the shops and people awake. The Turkish Old Town on the Muslim side of the bridge is quite the sight at any time of the day. In the morning, the keepers start to open their shops, during the day the paths are bustling with people, and in the evening the streets die down again into a peaceful echo. If you want things to take home with you – this is where you do it. You’ll find many Bosnian/Turkish coffee sets made from copper and other kinds of metals. There are MANY shops and stalls so be sure to shop around and don’t just settle on the one you find first. Aside from coffee, there are lots of artisan goods like beaded jewelry and many items made from carved wood. The east side of the Old Town from the Stari Most. The main material you’ll find things made form is copper. As a traditional and soft metal, copper is easy to work with to create all sorts of items and tools. You’ll find lots of coppersmiths banging away creating everything from coffee pots to spoons in the old town. Eric, however, always tries to buy a backpack patch of the flag of the country. Having missed a few countries because we didn’t find one (thanks, Romania), Bosnia came through. We found the perfect flag backpack patch and it’s a great souvenir with lots of meaning. The many mosques that dot the Bosnian countryside on the Bosniak side of Mostar. As we mentioned above, you’ll find the mosques on the east side of the river. The minarets (towers) make them easy to spot. Even if you don’t care too much about religion, some of these structures are worth checking out for the architecture and history. Koski Mehmet-Pasha Mosque was originally built in 1618 and, while it’s been rebuilt over the years, has a minaret that can be climbed for amazing views. We didn’t do this but we did enter the inner courtyard off the main road and had a peek inside the complex. It was very beautiful. Entering the mosque and minaret costs a few Bosnian Mark but we’re told (and Trip Advisor) says it’s worth it! You can’t go to Bosnia without trying a Bosnian/Turkish coffee. Traditionally made in a copper pot called a dzezva, the experience of pouring the brewed coffee with the grounds into your fildzani (cup) without getting the grounds into your cup takes practice. We had many coffees in Bosnia, and one of the best ones was at the coffee shop just past the west end of the Stari Most, across from the more established “Caffe Stari Grad” – although, a coffee from this Caffe Stari Grad would be a similar experience so try them all if you’ve got the time. Coffee plays a huge cultural and social role and we always enjoyed sitting down for a cup and a Turkish delight candy with it! The platform where photos are taken and people sun bathe/swim. If you’re keen to take a dip then you can do so in the sparkling blue Neterva river. However, there are a few things you should know. The river has a very fast current so if you aren’t a strong swimmer this might not be a great activity for you. You can ask a local about the conditions and where it is safe to go in, if at all. Generally, they will tell you it’s warmest between July and August. We’d advise to just follow the locals and dip off to the side close to shore where the water isn’t too deep. You’ll see the divers jump from the bridge throughout the day (after they fill a hat with tourist money) but they are professionals and jump/swim in the river all the time. Just be careful. Because of Mostar’s unique geography in a valley and split by a river, there are lots of hills and nearby mountains to be explored. A popular route is up to the cross on Hum Hill. We won’t get into the history, but as we’ve mentioned above, the cross itself stands as a bit of a contested symbol for the Muslim Bosniak side of Mostar from the Croat side – which is Catholic. In any case, there is a trail up to the cross that you can take for great views. We’re told the hike can take 2 hours up and 2 hours back into the centre of Mostar. We STRONGLY suggest asking a local or hiring a local guide if you are doing any hiking anywhere in Bosnia. It’s no joke that there are still uncleared landmines across the country in the remote areas that haven’t been de-mined yet. Yes, many of the main walking paths and routes are mine-free but this is an actual safety consideration if you’re in the Bosnian countryside. The war may have been 30 years ago but in many ways tensions (and reminders) still linger. Standing in Spanish Square with the “Sniper Tower” in the background. On the other side of the bridge from Eni Hostel was The Spanish Square. The small green space with memorials and trees is named after the Spanish soldiers who died fighting in a special mission during the Bosnian War. We sat there for a while just enjoying the sunny day and it was super peaceful. Then you can check out the Gymnasium Mostar. Officially called the United World College, it is the only immersion school in all of Bosnia & Herzegovina that allows for Serb, Bosniak, and Croat youth to go to school together. A pretty bold statement considering the political state of the country right now. The Gymnasium is a beautiful Austro-Hungarian era building. Close by, you also can’t miss the tall old concrete building that stands covered in graffiti. Before the war, it was bank offices. Now, the tallest building in Mostar is known by tourists because snipers during the war used it as their vantage point. On Google, you’ll find it called the “Sniper Tower”. Now, let’s be clear. This is not an attraction. It’s not open to the public. This is a war-time ruin that is yet to be dealt with in Mostar. Nonetheless, people wander in and climb but it’s kind of dangerous with broken glass and no railings. Apparently, the graffiti is lovely though and if you’re really keen to check it out then power to you. We’re all for unique experiences but we actually saw a police officer hop the fence to do a quick scan of the property – as if to check if people were trespassing or not. Needless to say, we didn’t make the effort to fence hop and check it out and we didn’t plan to. We fell in love with the flaky Balkan pastry filled with either meat, cheese, or spinach when we first had it in Montenegro. After that, we were hooked. Bosnia (and Mostar, specifically) took burek to a whole new level of love for us. At the end of the street at Eni Hostel, there was a little pekara (bakery) that sold the freshest, best burek we had on the whole trip (with the exclusion of Ulcinj and Kotor, Montenegro). It’s not healthy – but each morning it made the perfect breakfast. Best of all – it’s cheap. One Bosnian Mark got you one burek which was a large serving of spiraling pastry that you can tear off piece by piece or eat from the napkin. There was a little green park near the Lučki most bridge so that’s where we frequently ate our breakfast – overlooking the river. It was beautiful and delicious. So, if you’re in Mostar go to any pekara for burek but try the one we’ve described. We can’t even find it on Google Maps so you’ll have to search – but it’s worth it! The museum entrance is at the west end of the Stari Most! With such a long and divided history, we wanted to continue learning about the Bosnian war. Understanding the history of the former Yugoslav Republic and the Balkans, in general, was also important to us. That’s why we’re a little disappointed we didn’t research the War Photo Exhibition beforehand. TripAdvisor says that this is a must-not-miss if you want to see photographs about the sobering history of the Bosnian War. It’s right at the west end of the Stari Most in the buildings that tower up. 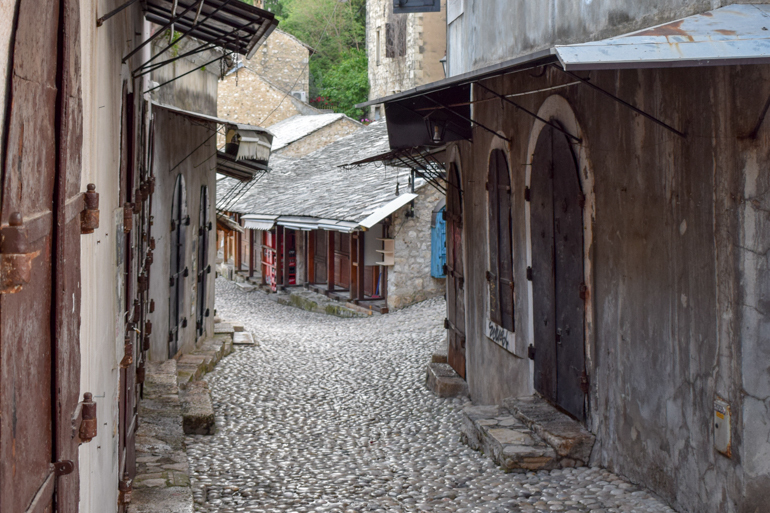 If you’ve been following along on our Balkan journey, you’ll know that we like free walking tours. They are a great way to get to know an area as told by a local and all you have to do is tip what you think it was worth. 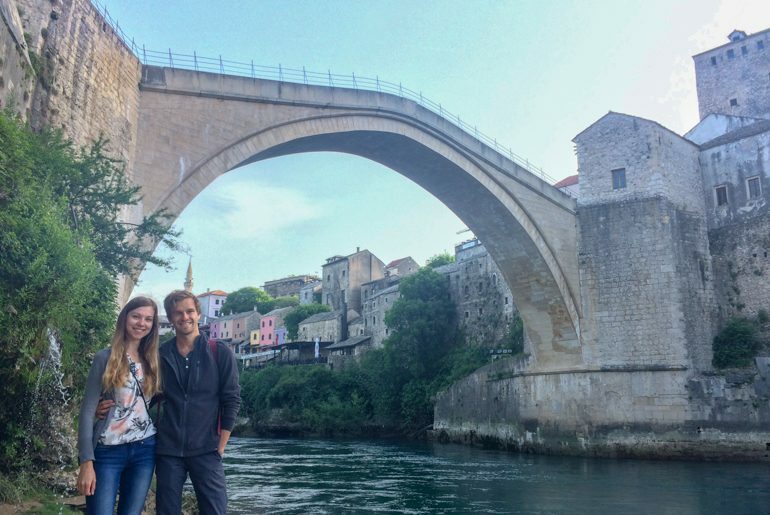 We’ve always had really good tours, and the free walking tour in Mostar by Mostar Free Tour was reviewed as the same! Unfortunately, the few days we were in Mostar was the weekend and then a holiday Monday. As such, we didn’t get to go on a tour. We had looked up Mostar Free Tour and they weren’t running that Monday. The tour left from the Spanish Square and, ironically, on Tuesday’s bus to Dubrovnik we SAW the tour meeting about to head off on their tour. So sad! We will definitely go next time we are in Mostar. 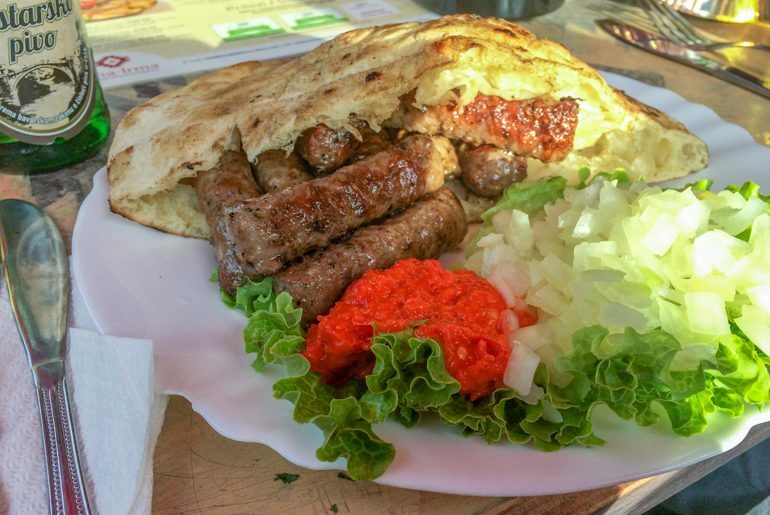 Okay, you don’t have to eat cevapi – they do serve other food! We ended up going to dinner at two different places – and we really liked each of them. Cevapi are the Balkan-style sausage that is served in many different countries. While the Mostar version was good, the Sarajevo version was better and fresher. However, that is understandable – there are cevapi restaurants in Sarajevo that only serve cevapi. We’ve written a Sarajevo food and restaurant post if you want to learn more! One of the first places we went to was Food House. We can’t find the website but you can read all the good reviews on Trip Advisor. It’s all the same information – good for vegetarians, good location close to the Stari Most, friendly staff, you can’t go wrong! Eric had the mixed meat platter which you can see below, and Lisa had the rice leaf meat rolls. Think cabbage rolls, but made with green leaves instead of clear cabbage. Both were excellent. We ate outside in the evening with perfect weather and good cheap food and a beer. It was a really great dinner experience overall! The second place we tried was Tima Irma. Again, we had a great experience. This one is more on the main path towards the bridge so it’s a little busier with people walking by but nothing too crazy. Once again, the evening weather was perfect for sitting outside. 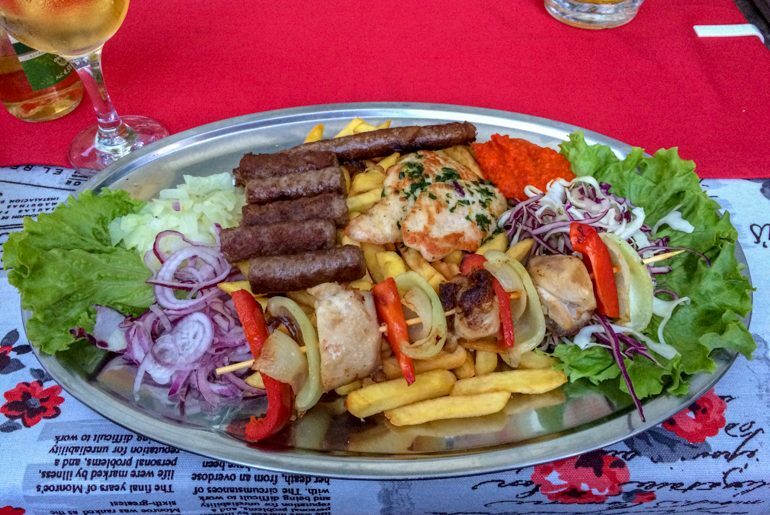 Eric had the cevapi (pictured below) while Lisa had another local dish called pljeskavica. It’s a Serbian hamburger, essentially, that is made from the same meat as cevapi but done a little differently. She liked it! They also serve vegetarians well with many veggie dishes and non-meat goodness on the menu. The cevapi at Tima Irma was really delcious as well! If you want to check out the website for Tima-Irma, you can find it here. They are a little more put together with a website and everything. Overall, there are lots of places to eat in Mostar. Some are noticeably touristy while others you’ll find further away from the centre to be more local. Not that “touristy” is bad, but we usually don’t eat at the places that hand you a menu as you walk by. If you’re feeling up for it, go wander about not just in the touristy centre and try a place or two. That’s how we found the bakery at the end of our street and we are so glad we did. This is something that we wish we would have done if we had done more research before heading into Bosnia. 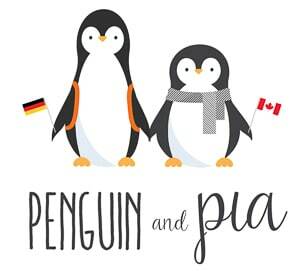 As we mentioned, the itinerary was booked on the fly so we did the transportation beforehand to stick to certain dates to be in certain countries. In short, we needed more time in Bosnia & Herzegovina! Like Krka National Park in Croatia, Kravice is a beautiful set of falls about 40 kilometres south of Mostar. They cascade as part of the Trebižat River. If you have a car, it would be very easy to get to. Otherwise, you can rent a taxi for the day and be taken there for a fixed price – as suggested by our guesthouse family. Since visiting Mostar, we personally know people who have been to the falls and we are very jealous as they look beautiful. If you were in Mostar with limited time, you could look into a tour to Kravice from Mostar. This one with Get Yout Guide is basically the above option of hiring a private driver for the day. Thought we’d include it for you! If you want to learn more about day trips from Mostar, you can read all about them soon. 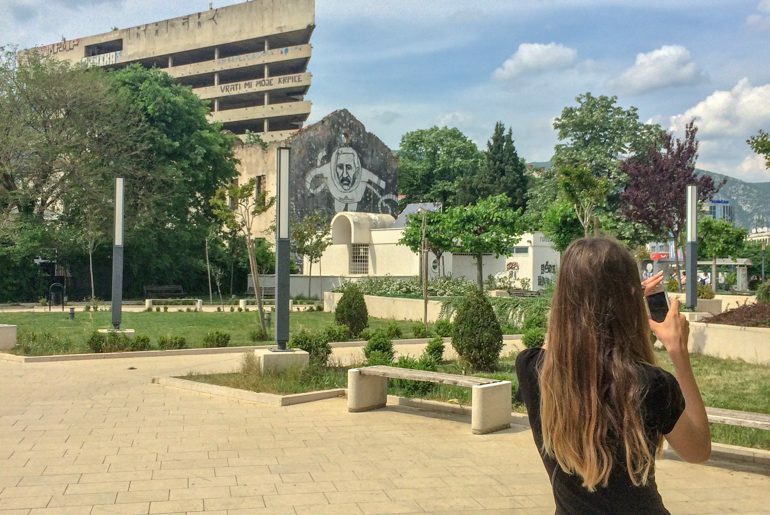 We got a guest contributor and local from Mostar to help us out and suggest the best ones. It’s being written as we speak! 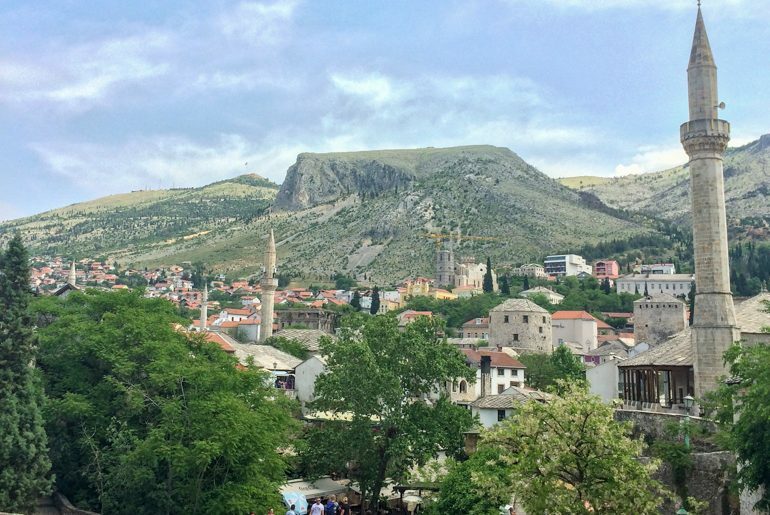 And there you have it – some of the best things to do in Mostar! What do you think? Did we get it right or did we eat too much burek? You can get in touch and let us know – we’re always happy to chat about Bosnia and Herzegovina!